I got an education the other day about when motorists can enter a bike lane to turn. Maybe I’m just a slow learner and this will come as no surprise to the many cycling advocates out there but it was a disappointing revelation to me. 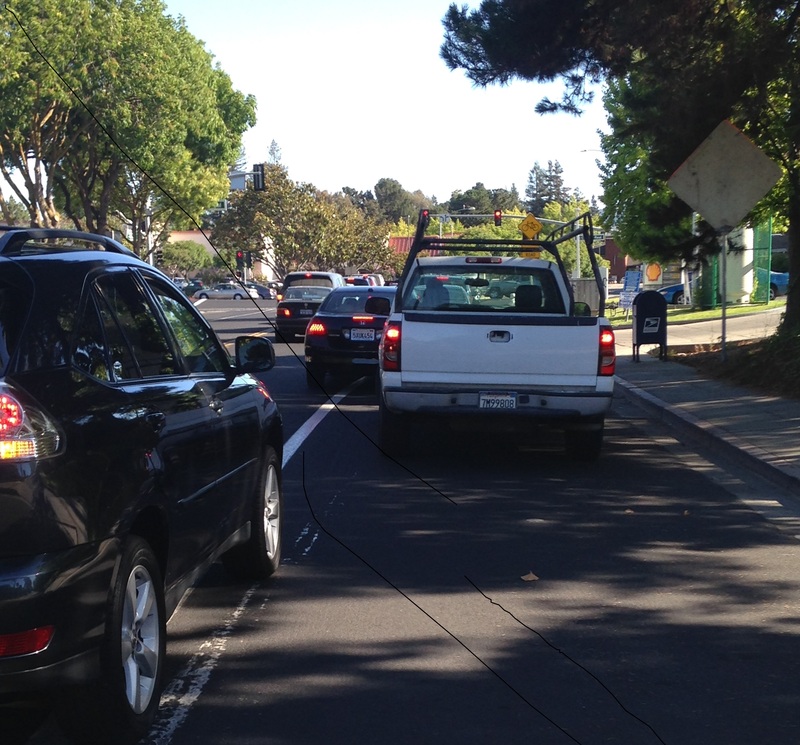 I encounter the above scene in Mountain View on one of my alternate commute routes. It’s on Sylvan Avenue going Southbound at the El Camino Real traffic light. As you can see, several vehicles are to the right of the SOLID WHITE LINE preparing to make a right turn. Just ahead of the dark sedan in front of the white pickup is a dashed white line. I had always understood that the dashed white line was there so we all would know when motor vehicles could enter the bike lane. Car traffic was at a standstill for a minute or two so I took the picture since it seemed like a clear violation. Armed with this evidence, I sent the photo to ‘Ask Mountain View’ (great little app BTW) and requested that the Police check this out and provide some enforcement. Within a day I got a response from the Mountain View Police that the vehicle code says cars can enter the bike lane within 200 feet of an intersection so in this case there was no violation. For those who are distance challenged, this is 2/3 of the length of a football field – quite a long way. The part of the bike lane with the dashed line couldn’t have been more than 2 car lengths (let’s conservatively say 60 feet). So I emailed back asking what took precedence – the vehicle code or the white lines? And if the 200 foot rule took precedence WHY EVEN PAINT dashed lines? The Sergeant responded “I know this is confusing” and again sited the 200 ft rule in the vehicle code. However, he did not address the rule about not crossing a solid white line or in any way allay my confusion about this apparent contradiction. So I guess those solid lines don’t even give us imaginary protection?